Facilities: WCs, shops, pubs in Elterwater and Chapel Stile. Several pubs also en-route. Great Langdale is a landscape of much diversity – from its lofty ridges, mountains tops and steep fell sides of bracken and juniper, to its tumbling waterfalls, ancient woods, farm pasture, and flowing becks in the valley below. It has been shaped by people for thousands of years. Aside from the hill farms with their hardy Herdwick sheep, there are remnants of other industries - ranging from the Neolithic Stone Axe Factory to the former mines, quarries and gunpowder works. The period after World War Two was a time of particular change in Great Langdale, just as it was through out Cumbria’s fells landscape. 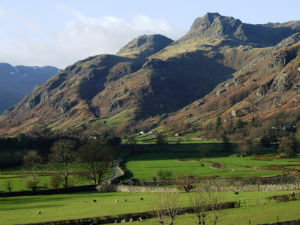 This audio trail will guide you through the recent history of the Great Langdale landscape. You’ll learn about the revolution in farming, explore traditional woodland practises, and discover the wildlife- rich hay meadow of days gone by. Listen as you walk to the memories and stories of the people who remember the landscape, it’s wildlife, and the transformations that have taken place since the 1940s. Download the mp3 audio files below onto your mp3 player to accompany you on your walk. Alternatively, you can download the audio files to your computer and listen to them at home. A transcript of the audio trail is also available to download as an Adobe PDF file if you would rather read it than listen. The audio trail is complemented by Ted’s Great Langdale Landscape audio slideshow.